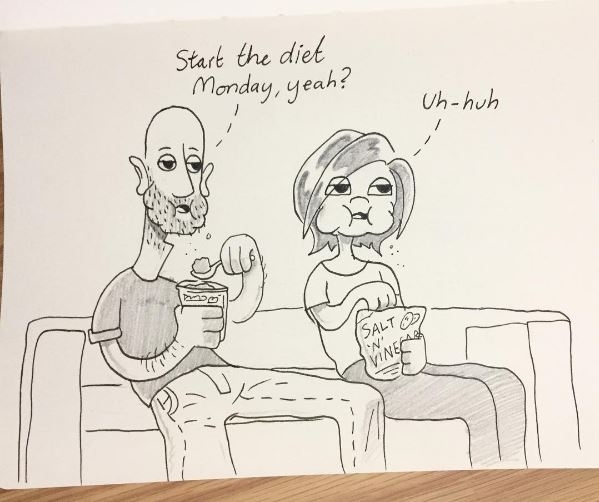 A Brighton designer and illustrator has become a global Instagram hit by drawing scenes from everyday life with his girlfriend and daughter. For the past five years, Pete Duffield, 38, has posted illustrations of the good and not-so-good times – and he now has 75,000 followers. His success has made headlines in national newspapers and it’s been featured on Italian, Swiss, Slovakian and Russian blogs/portals. There are fans in almost every country, from Iran to the USA’s Hawaii. 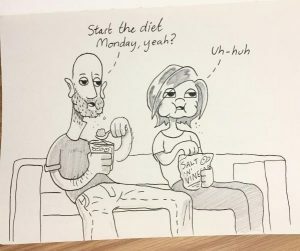 The University of Brighton graduate believes his frank and honest drawings resonate with viewers who identify with both life’s trials and its amusing times. Some portray intimate moments in the couple’s relationship, their love for each other and their baby Poppy. Pete, who works for a Brighton design agency, began the drawings when he first dated his girlfriend Kellie Gage, 33. Pete graduated from the University of Brighton with a Illustration BA(Hons) degree in 2010: “I started out on the Graphic Design BA(Hons) but was invited to switch to illustration for the final year because my work was predominantly illustrative and the two courses were so close. “I enjoyed my time immensely and found the staff and my classmates incredibly inspiring.